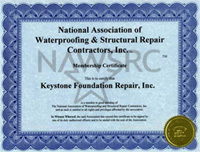 At Keystone Foundation Repair we are a nationally recognized waterproofing company. 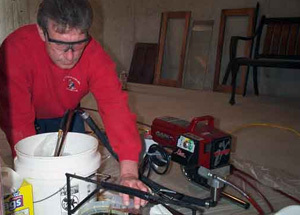 Our waterproofing technicians are all trained in the latest basement waterproofing techniques at our product manufacturers headquarters in Boston, MA. The French Drain method for interior basement waterproofing. Keystone's interior waterproofing carries a "Lifetime Warranty"
Many basements only have tar pitch applied to the exterior walls if anything at all. Over time this tar pitch cracks and allows for water penetration. We apply rubberized elastomeric membranes with drainage board to ensure a water tight wall with relief areas for the water. 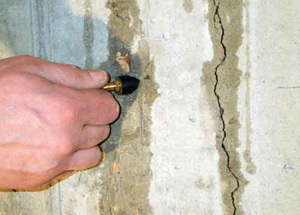 Waterproof warranties are offered on new poured concrete foundation walls that have our rubberized membrane installed. Injection holes are drilled to intersect the crack, (they alternate on each side of the crack). Mechanical injection ports are inserted into the holes. High quality hydrophobic urethane is injected into each port. This urethane expands up to 30 times the original volume. The closed cell nature of the urethane is not subject to shrinkage when exposed to changes in temperature or moisture. Keystone Basement Technologies state of the art systems will transform your old damp wet basement into the dry 21st century. 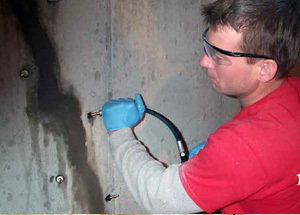 We are a Mid-Atlantic leader in the basement waterproofing and structural repair industries. 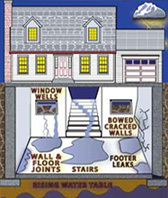 No other area waterproofing company offers as many multi-method approaches to basement waterproofing. 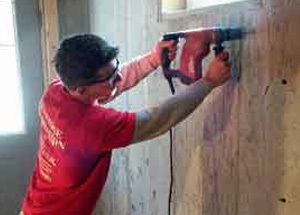 Our work is customized to solve your particular basement problem. All of our work meets or exceeds FHA/VA standards. Simply fill out the form, including your name email, phone number, estimate information, and the best time for us to contact you. You will receive a confirmation after submitting the form, and one of our representatives will get back to you as soon as possible.